A rebel group in Ethiopia said it will demand a referendum on self-determination for the country’s troubled, gas-rich Somali region during landmark peace talks with Prime Minister Abiy Ahmed’s government. he plan by the Ogaden National Liberation Front, which has staged a low-level insurgency in Ethiopia’s east for more than three decades, comes as Abiy invites once-banned opponents to take part in elections. The demands may aggravate a scramble for the region’s energy resources, including natural gas reserves the government estimates will eventually earn it $7 billion a year. 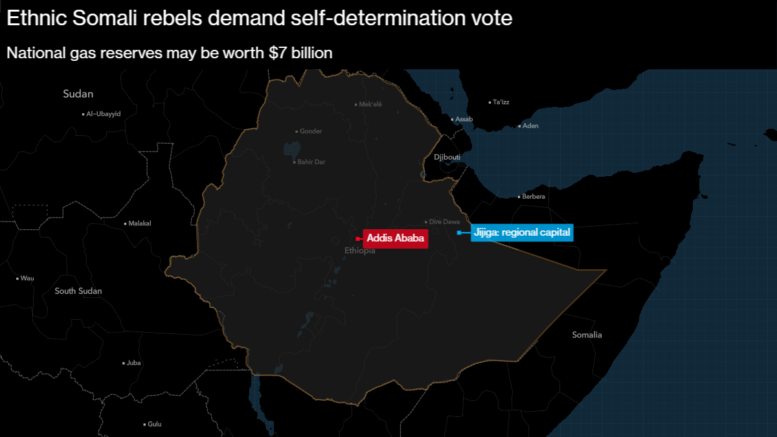 At stake are an estimated 8 trillion cubic feet of natural gas in the Ogaden Basin, where exports are due to begin 2021 via a pipeline to neighboring Djibouti. A unit of China Poly Group Corp. has also started testing oil deposits. “We want to achieve self-determination recognized by international law under the current Ethiopian constitution,” Ahmed Yassin Abdi, the ONLF’s foreign secretary, said by phone from the Kenyan capital, Nairobi. “We want our people to have a right to decide.” He said his group has no preconditions for the talks. The region’s new president expressed support for greater autonomy. Ethiopia, Africa’s second-most populous country after Nigeria, is a federation designed to give autonomy to its dozens of ethnic groups. The ONLF has long maintained that the Somali regional state, which it calls the Ogaden and borders war-torn Somalia, hasn’t been properly represented by the federal government. Ethiopia’s constitution enshrines the rights of people with “a large measure” of common culture, customs, language, identity and “psychological makeup” in an “identifiable, predominantly contiguous territory” to seek self-determination and even establish their own states. While he wouldn’t disclose the number of armed fighters the ONLF has, the figure is thought to be significantly diminished from a decade ago. A special police force in the Somali region has been notorious for its alleged counter-insurgency tactics, with accusations it jailed and tortured people suspected of having ONLF sympathies. Since the regional president, based in the local city of Jijiga, was ousted by federal forces in August, authorities and the group haven’t clashed, according both to Ahmed and the new state president, Mustafa Omer. Abdiwasa Abdillahi Bade, an assistant professor of political science at Addis Ababa University, doesn’t see “a clear vision and objective” from the group. “Before we talk about self-determination, we have to establish who is ONLF and who represents ONLF,” Abdiwasa said. Mustafa said regional authorities are letting the ONLF mobilize grassroots support and he’ll help arrange its formal talks with Abiy’s government in the coming weeks. The president welcomed the possibility of the ONLF taking part in federal elections slated for 2020. Ahmed said the ONLF will discuss the possibility of its disarmament with the government, and, should the negotiations face difficulty, Somalia President Mohamed Abdullahi Mohamed offered support in the talks during a Sept. 5 meeting in the Eritrean capital, Asmara. Once a deal is reached, the ONLF may compete in elections, he said. “We need to have a negotiation — agreement on a comprehensive political settlement, and peace in the Ogaden — then oil companies can come and explore,” Ahmed said.